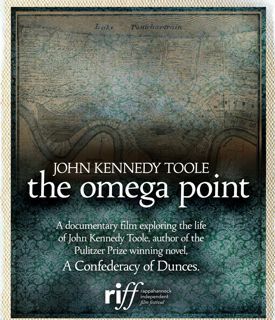 The film screening for Joe Sanford’s John Kennedy Toole: The Omega Point will be held on May 8th at the Fredericksburg Athanaeum. Click here for more details. There will be two screenings: 7pm and 10pm. Joe Sanford, Joel Fletcher and I will be on a panel answering questions between the two screenings. Space is limited so tickets are a necessity. Hope to see you all there!